Suncourt Holiday Flats are a selection of self contained flats that are located within a Victorian property just a short walk from the Cromer town centre in Norfolk. The self catering flats are well equipped with periodic features. Some even offer sea views. We also have a private car park. The self catering flats sleeping 6, have 2 double bedrooms, 1 with a double bed and 1 with a double bed and 2 single bunks. All flats have uninterrupted panoramic sea views overlooking the beach, pier and the sunken gardens. Flats 3, 5 and 7 have the benefit of the octagonal bay. Just 300 metres from Cromer town centre, the bus and railway stations, Suncourt Holiday flats are ideal for holidays any time of year. Cromer is a bustling Victorian seaside town with a good range of shops and plenty of places to eat. 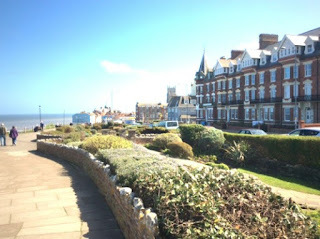 Try a Cromer Crab salad in one of the town's many public houses, dine at one of the town's many restaurants, good old fish and chips, Indian, Chinese or traditional English dishes, the choice is yours. The town has a fine selection of food shops, local bakers, butchers, greengrocers and fishmongers, while the Morrison's superstore next to the railway station is open seven days a week all year round. 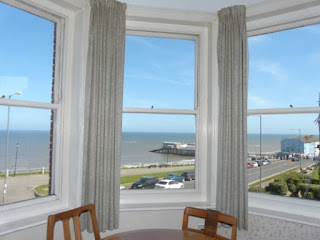 Cromer is a great place for holidays any time of year. There are miles of footpaths and circular walks and plenty of sports and places to visit. Enjoy a round of golf at Royal Cromer Golf Club, go horse riding at West Runton, or swim at the leisure centre in Sheringham. Take a trip to the Norfolk Broads or visit the City of Norwich. Ride on a steam train, hire a bike and discover the many 'quiet lanes' and cycle routes. Enjoy a game of pitch and putt, try your hand at bowls in North Lodge Park. Visit Cromer during Cromer Carnival Week and join in the fun.